Macroglossa troglodytus Butler, 1875, Proc. zool. Soc. Lond. 1875: 242. Type locality: Ceylon [Sri Lanka]. Synonym. Macroglossa insipida Butler, 1875. Synonym. Macroglossa troglodytus Boisduval, 1875. Synonym. 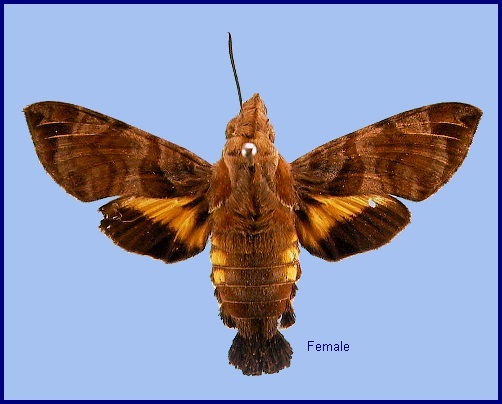 Macroglossum insipida sinensis Mell, 1922. Wingspan: 40--54mm. A small species. Forewing much variegated with slaty-grey, the lines rather prominent, antemedian band oblique, not always completely filled in with black, often touching first discal line; second discal line heavy, dilated distad behind M1. Underside of abdomen and disc of wings ferruginous; bases of wings more or less shaded with yellow; palpus dirty grey, middle of breast vinaceous-olive (Bell & Scott, 1937). In the male genitalia, harpe a long bar with an apical row of small teeth along the dorsal edge (like a toothbrush). Vesica with two large cornuti; dorsal cornutus long, narrow and directed anteriorly towards the right side of the long axis of the aedeagus; ventral cornutus shorter, broader and directed to the right, perpendicular to the long axis of the aedeagus. Flies deep within bushes to reach nectiferous flowers (Li, 1992), particularly those of Duranta erecta. Active at dawn and dusk, with only a few coming to light. Bell & Scott (1937) state that it was very plentiful in southern India towards the end of the rainy season in forests with very heavy rainfall, up to an altitude of 300m. 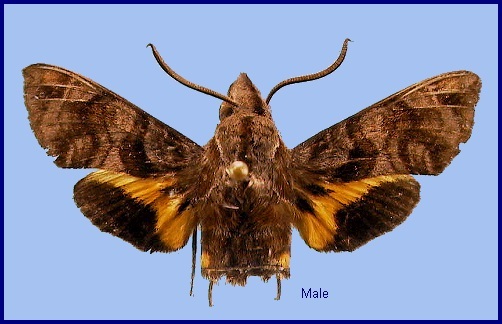 In the Khasi Hills of northern India (Meghalaya State, but before 1970 part of Assam), it was very common from May to September in forest areas at an altitude of about 1500m, where it was probably the most common species of Macroglossum. China: iv (Hainan); vi-vii (Hainan); vii (Hainan; Sichuan; Hong Kong); 3.viii (Hong Kong); 26.ix-15.x (Hong Kong). Taiwan: viii (Nantou Hsien). Japan: v-viii (Ryukyu Archipelago). OVUM: Pale green, slightly oval, shiny and smooth. LARVA: Full-fed 48--50mm, width 5.5mm. According to Bell & Scott (1937), in the final instar head rounded-quadrate in shape, dorsal line of vertex very slightly depressed. True clypeus less than one-half length of head equilaterally triangular with apex rounded; false clypeus with apex acute, reaching to one-half length of head, sides curved outwards; labrum about one-half length of clypeus; ligula as long as labrum, kidney-shaped; cutting edge of mandible finely toothed. Surface of head dull and smooth. Body as in other Macroglossine larvae. Surface dull and smooth; horn rather short, very thick at base, tapering evenly to a blunt point, covered with small, conical tubercles directed distad. In the green form, head green with a whitish (or yellowish) subdorsal stripe running down side of clypeus; a whitish (or yellowish) stripe separates face from cheek. Labrum green; ligula whitish; basal segment of antenna green, other segments rusty; mandible pale green, tip dark rusty. Body grass-green covered with whitish (or yellowish) dots. 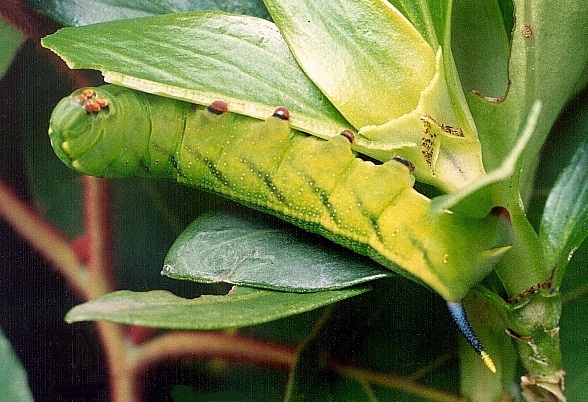 A darker green dorsal stripe runs from segment 2 to base of horn, with a diffuse pale stripe on each side of it. There is also a narrow white (or yellow) dorso-lateral stripe on the same segments, edged narrowly above with darker green. There are broad dark oblique lateral stripes on 6-11, upper edge diffuse, lower edge sharply defined. Horn with basal two-thirds plumbeous blue-black, distal third orange-yellow, tubercles black except at tip, where they are orange. True legs orange, basal segment suffused reddish; prolegs with ankles pale pink, feet livid white. Spiracles broadly oval, flush, pale yellow with: a broad, reddish-brown central band, the whole narrowly bordered black. There is also a darker form in which the head is dark brown with a russet-ochreous stripe separating face from cheek. Body russet-chocolate dotted with white. A darker dorsal stripe runs from segment 2 to base of horn. There is also a russet-ochreous dorso-lateral stripe from 3 to base of horn (obscure on 2), and similarly coloured oblique lateral stripes on 5 to 11, the last running to base of horn. The angles between them and the dorso-lateral stripe also russet-ochreous, forming a series of triangular patches. Horn violet-black, tip shortly orange-red. True legs russet-ochreous; shanks of prolegs dark russet, feet whitish. Spiracles pale russet centred with darker russet. In another form the body-colour is dark brown, with markings as above (Bell & Scott, 1937). 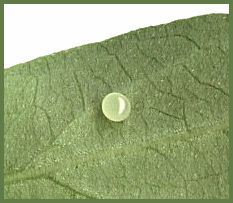 PUPA: 30mm, width 8 mm. Mainly a dry bone-colour, thorax and wing-case greenish, tongue-case and dorsum of abdomen rusty. Wing-case, legs and antenna mottled sparsely with plumbeous-grey. There is a dorsal stripe, black on thorax, green on abdomen; broken, blackish, longitudinal stripes on venter. Hind bevels of segments 8 to 10 brownish; spiracles black; cremaster pale rusty, tip black. 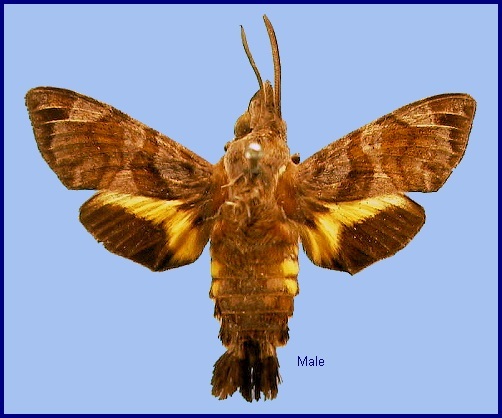 Tongue-sheath projecting shortly in front of head; tip of tongue spatulate; antenna longer than fore leg and reaching to middle of wing-case. Surface shiny, head and thorax smooth, abdomen shallowly pitted. Front bevel of segment 9 with a long channel reaching from dorso-lateral to ventro-lateral region and short, transverse, irregular ridges, the anterior ones more prominent and closer together than the posterior ones. Spiracle of 2 a slit, a slightly raised oblong transverse lobe projecting from the front margin of 3 behind it, the hind margin of 2 emarginate in front of it; other spiracles elongate-ova]. Cremaster triangular, tip emarginate-truncate, with a small conical tubercle at each lateral angle of the truncation; ventral surface longitudinally hollow, with a median keel near base; surface smooth and shiny (Bell & Scott, 1937). 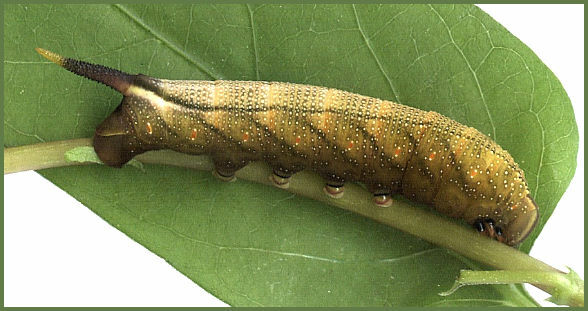 The pupa makes a low knocking note when alarmed. Larval hostplants. Hedyotis hydyotidea and Hedyotis acutangulata in Hong Kong; Hedyotis uncinella and Hedyotis scandens in India (Bell & Scott, 1937, as well as Spermacoce hispida (Rubiaceae) and Corchorus capsularis (Tiliaceae). China: Sichuan (Emei Shan, 3620'; Kangding; Xiaolou); Yunnan (Kunming; Yanmen); Guangdong; Hong Kong (Lantau Island; Ping Chau Island; North Point); Hainan (Chengmai; ??Secha; ? ?Ta Hian). Taiwan: Chiai Hsien (Shuicheliao; Taipei Hsien (Fushan); Nantou Hsien (Kuantauchi). Sri Lanka, southern and eastern India, Nepal, Thailand, southern China, Taiwan, Japan (Ryukyu Archipelago), Vietnam, Malaysia (Peninsular, Sarawak), Indonesia (Sumatra, Java, Kalimantan). (Subsp. 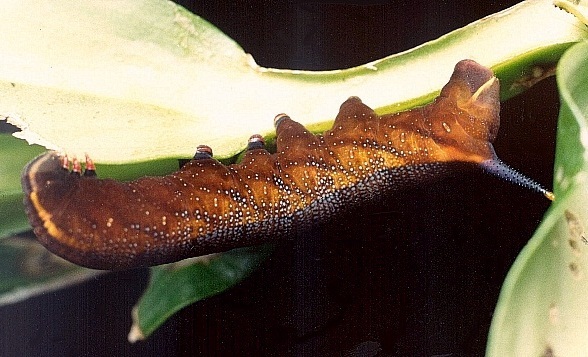 papuanum Rothschild & Jordan, 1903, is found in New Guinea and Queensland, Australia, where the larvae feed on Spermacoce latifolia (Hasenpusch, Lane & Moulds, 2012)).